Printer supplies are essential to making high quality ID cards that last. Using the correct supplies for your id card printer keeps it running in peak performance throughout its life. ID Card Ribbons, ZXP Series 3 IX Series YMCKO Color Ribbon, 200 Images/roll. The ribbon is used to print in a variety of colors: yellow (Y), magenta (M), cyan (C), and black (K). The remaining overlay (O) provides an extra layer of protection for the card. This ribbon is used to print color on one side of a card. This ribbon is compatible with the ZXP Series 3 Printer. 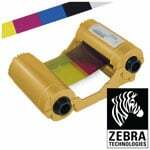 ZXP Series 3 Ribbon, ZXP Series 3 IX Series Eco High Capacity YMCKO Color Ribbon 280 Images/roll. The ribbon is used to print in a variety of colors: yellow (Y), magenta (M), cyan (C), and black (K). The remaining overlay (O) provides an extra layer of protection for the card. This ribbon is used to print color on one side of a card. This ribbon is compatible with the ZXP Series 3 Printer. ID Card Ribbons, I Series 5 Panel (YMCKO) Color Ribbon with 1 cleaning roller, 330 Images/roll. The ribbon is used to print in a variety of colors: yellow (Y), magenta (M), cyan (C), and black (K). The remaining overlay (O) provides an extra layer of protection for the card. This ribbon is used to print color on one side of a card. This ribbon is compatible with the P330i, P430i, P520i, P310i, P320i, P420i Printers. ID Card Ribbons, 5 Panel Full Color (YMCKO) Ribbon, 300 images. The ribbon is used to print in a variety of colors: yellow (Y), magenta (M), cyan (C), and black (K). The remaining overlay (O) provides an extra layer of protection for the card. This ribbon is used to print text and full color images on one or both sides of the card. Compatible with Primacy ID Card Printers. ZXP Series Card Printer Accessories, I Series transfer film, 1250 images (single-sided), 625 images (double-sided), for ZXP Series 8 Printers. Film must be used with a printer that has re-transfer printing technology capabilities. Compatible with ZXP Series 8 and ZXP Series 9 Printer. ID Card Ribbons, I Series 5 panel (YMCKO) Color Ribbon, 200 Images/roll. Environmentally friendly design. The ribbon is used to print in a variety of colors: yellow (Y), magenta (M), cyan (C), and black (K). The remaining overlay (O) provides an extra layer of protection for the card. This ribbon is used to print color on one or both sides of a card. This ribbon is compatible with the P100i, P110i, and P120i Printers. Ribbon, Full Color (YMCKO) Cartridge, 500 images per roll. The ribbon is used to print in a variety of colors: yellow (Y), magenta (M), cyan (C), and black (K). The remaining overlay (O) provides an extra layer of protection for the card. This ribbon is used to print text and full color images one or both sides of the card. Compatible with DTC4500, DTC4500e. This part is also known as 045200. ID Card Ribbons, I Series Full Color 6 Panel (YMCKOK) Ribbon with 1 cleaning roller, 170 images. The ribbon is used to print in a variety of colors: yellow (Y), magenta (M), cyan (C), and black (K). The remaining overlay (O) provides an extra layer of protection for the card. The second (K) allows for black printing on the back of the card. This ribbon is used to print text and full color images on one side and black on the back side of the card. Compatible with P420i, P430i, P520i. ID Card Ribbons, Full Color (YMCK) Ribbon, 500 images. The ribbon is used to print in a variety of colors: yellow (Y), magenta (M), cyan (C), and black (K) on the front of the card. This ribbon is used to print text and full color images on one or both sides of the card. Compatible with HDP5000, Hdpii. This part is also known as 084051.